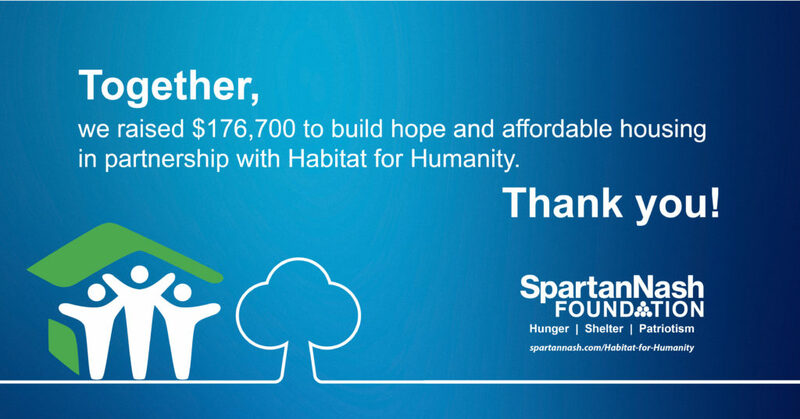 GRAND RAPIDS, Mich. – Together with its store guests and company associates, the SpartanNash Foundation’s scan campaign to build hope and affordable housing raised $176,700 on behalf of more than 50 local Habitat for Humanity partners in Michigan, Iowa, Minnesota, Nebraska, Ohio, North Dakota, South Dakota and Wisconsin. Since 2006, nearly $1.7 million has been raised by SpartanNash and its charitable giving arm – the SpartanNash Foundation – to support local Habitats and hardworking homebuyers. Between Feb. 7 and 18, the SpartanNash Foundation hosted the companywide scan campaign in SpartanNash-owned stores throughout the Midwest, giving store guests the opportunity to donate $1, $5 or $10. SpartanNash stores teamed up to support local Habitat partners, resulting in the $176,700 total – equivalent to more than 350 landscaped backyards where children can safely play; 175 education classes for homebuyers regarding financial stability and saving; 115 accessibility ramps to eliminate barriers; or more than 35 kitchen projects for families to gather and create memories around the table. One hundred percent of all funds raised during the annual scan campaign to secure shelter – one of the Foundation’s missions – go directly to local Habitats. SpartanNash underwrites the costs to run the scan campaign, contributes funding and encourages associates to volunteer with local Habitat partners. For a complete list of stores that participated in the companywide scan campaign and their local Habitat partners, visit: spartannash.com/Habitat-for-Humanity. The retail scan campaign to secure shelter is the first of four fundraising campaigns the SpartanNash Foundation will conduct in 2018. Upcoming scans will raise funds and awareness for Special Olympics (May 2-13), patriotic partners (June 27-July 8) and community food pantries (Oct. 24-Nov. 4).